Lunch, under $5, not including tax and tip, no sandwiches, hot dogs, Polish, subs etc. I'll start with three entries, all Chinese, the first of which I had lunch today. BBQ Combination over rice atSun Wah. $3.75 for crisp skinned, juicy roast pork and rich, delicious roast duck, bit of still toothsome Chinese broccoli, half of salty preserved egg (still in the shell) piled over rice. Not to mention included pot of tea and thin, palate awakening soup, with a couple of chunks of carrot. Add to this a not-bad-at-all table chili oil and we have a solid entry in the $5 and under lunch category. Spring World's combination lunch menu, one of the best lunch deals in Chicago, offers one-from-column A, one-from-column B for $3.95 with tea, rice and, depending on the day, fair to good hot and sour soup. My typical combo is, maybe the best version in Chicago, kung pao chicken and ma pa tofu, Spring World's ma pa tofu contains ground pork, both served in generous portions. As an added bonus, Spring World's table chili oil is quite good. American Cantonese lunch specials starting at $3.75, with the majority in the 4.95 range. My preference, at $4.95, is cashew chicken, hold the corn starch gravy, which yields a much lighter dish. The cashew chicken lunch special includes not-bad-at-all won ton soup, white rice, egg roll and a bowl of crisp chow mein noodles. Bonus points for decent chili oil, making their own Chinese mustard and friendly, efficient service. I (somehow) feel compelled to point out that Palace Restaurant is, what is referred to on LTHForum, sometimes with a bit of derision, American/Cantonese or Schaumburg/Chinese. Me, I like American Cantonese, as evidenced by my, without embarrassment, vocal appreciation of Kow Kow in Lincolnwood. My sure fire order is the peanut butter-rich '50's style egg rolls that are IMO the best version that I have ever had. Decent wonton soup. And Beef Kow, extra spicy. Glutinous, yes. Tasty? Yes! When pigmon gets nostalgic he'll order the "garlic chicken" - which is deep fried chicken doused in a starchy, gloppy, garlicky, mess. It is strangely addicting, especially when the sauce is doctored with the magical combination of chili oil, mustard, duck sauce, and vinegar. When we lived in Evanston, we would secretly go to the Palace a few times a month, but now when we need an egg roll fix, we just go to their sister restaurant, The Shanghai Inn on Damen. The sisters that run both of these restaurants are great hosts. Listening to them try to field "special requests" at the Morton Grove location is pure comedy. They do it with a level of grace that borders on sainthood. For my lunch under $5, I'd say a Cubano w/ black beans and rice at La Unica. You could probably squeeze in some plantains too and still stay under the $5 mark. Or you could skip the plantains and use your change to buy a big-ole-bag of dried chiles. On weekends, the roast pork with boiled hominy and salsa fresca at Panaderia Cuenca, across from the Latin Sandwich Cafe at Irving Park and Elston. $5. Two eggs over easy with thinly sliced Portugese Sausage and Rice at Aloha Grill on Clark in Lincoln Park. $4.95. When I used to work in the area I used to go to Pita Inn for there lunch special which is $3.95 and has a lot food for the price. My favorite cheap lunch is at El Centro in Naperville. $3.99 gets you the special of the day, usually a mini-burrito, tacos or quesadillas, with sides of beans (nice char flavor, too) and rice, as well as a medium soda (25 cents for a refill) and a complementary cup of their chicken or vegetarian bean soup. It always fills me up. There are things about El Centro that are problematic - their salsas, for instance, are anemic. But a good al pastor burrito or taco, or even an order of plain quesadillas at the price are a fine way to go. here's a very old post on CH on the topic. Though it's old, and I 've learned many many things since then (like maybe to get pho at tank rather than pho hoa), most of these recommendations still hold, for tacos nowadays I'd probably close to home hit supermercado chapala, further afield I'd go to atotonilco. polster wrote: When I used to work in the area I used to go to Pita Inn for there lunch special which is $3.95 and has a lot food for the price. be too much as well). might actually be an anytime special) which Ive never actually tested. a chicken biryani for 4 bucks, both of which I *have* actually tried). I went to the Palace for the 60's retro American-Chinese lunch. It returned to my mind a Mother's Day lunch when I was in 4th grade. We went to a Chinese restaurant, we all ordered chop suey and threw lots of chow mein noodles. We felt quite content eating all the crunchy, gooey stuff. Today's Cashew Chicken with fried rice was a walk back to my youth. I was also quite anxious to try to peanut buttery egg roll. One bite and I knew that taste from long ago. Actually, some peanut butter added to some tasteless egg rolls sold today wouldn't hurt. Our service was brisk and efficient. I learned from Gary that the 30-ish waitress is the friendly one, who wasn't present. The decor has not been touched since it was first installed in the 1960's. Their decorator certainly selected materials for their ease of maintenance and longevity. When I walked out the door, I left my youth and returned to the 21st century. Total time travel experience: food and all. Their take-out menu describes ‘Happy Hour for Richness,’ from 11:30 PM (I’m sure it is intended AM) – 5:30 PM, for $3.75 you can have: A. Beef brisket or BBQ pork noodle soup; B. Crispy chicken wings with fries; C. Onion Crispy Pork Chop with Fries; D. Egg and Ham Sandwich; and E. Tomato and ham sandwich. anything near O'hare?... i'm dying here..
most of my under $5 in the loop (chicken planet e(a)t al(l), are now over $5! but, just for the group, i'll chek out a few i've recently heard of and get back to you. golden buddha in the loop had a great teryaki salad special when it first opened. Had a nice $4.99 lunch today at the Sphinx in Niles. Not destination lunch dining, but a good, inexpensive, option if in the neighborhood. I had the Lunch Special Veggi Combo consisting of Falafel, hummus, baba ghanouj, fatoush salad and lightly griddled pita. I especially enjoyed the fatoush salad, the veggies crisp and fresh with red and green pepper and crunchy croutons made from pita. The Sphinx was not busy at lunch, and it seems set-up more as a night club, with a full bar, large dance floor, DJ booth, than a restaurant, but the waitress was efficient, veggie combo hit the spot so it may very well be more of a restaurant than the glittering disco ball would lead one to imagine. Last edited by G Wiv on May 23rd, 2005, 11:04 pm, edited 1 time in total. Did they have the black lights at noon on? I was there once and wished I'd worn different clothing. I did happen to see the Sphinx today but opted to go to Pita Town instead. I was at Pita Town last January. Remembering how much I enjoyed the food last time, I returned with pleasure. On this occasion, I ordered the $4.99 lunch special which included a chicken kabob, shawarma, kefta kabob, falafil, rice, salad, pita and a drink. In addition, I ordered a spinach pie, small baba ghannoug, a yogurt salad and lentil soup, which I shared with a friend. They also offer another $4.99 lunch special with rice, pita, salad, a drink and your choice of: shish kabob, shawarma, chicken kabob or stuff grape leaves. Sounds good to me, though. I only see one brief mention by Zim of Mei Shung on this board, so I think it could use a thread of its own....but we'll save that for after I have had a few more meals there. Mei Shung has the "standard" 36 item lunch specials, over half of which are $4.75, although the most expensive shrimp dishes only clock in at $5.55. The special includes Hot & Sour or Egg drop soup, an egg roll and fried rice. However, I was offered a choice of egg roll, pot stickers or crab wonton. Since the egg rolls at quite a few places that have the lunch special are fried in batches and left to soften under a heat lamp, I thought the additional choices were a nice touch. One of the very special things about Mei Shung's lunch specials is that they are offered even on the weekends. I am forever running across those lunch specials that sound like such a bargain, but are only available if you are in the wrong place at the right time. Still not sold? I wasn't either. I was not sure that my friend who invited me had as discriminating taste in Chinese food. Turns out, she does. I had Chicken with String Beans, which put me over budget at $5.25. The meal was light...in that it was not that greasy, gloppy, heavy on the corn starch under $5 bucks lunch special you come to expect with an under $5 lunch special option. The soup was served hot, though it could use a bit more pepper or spice to get the nose running. I judge H&S by whether it makes me break a sweat. The pot sticker was not fresh off the pan, but it was flavorful. This may not be destination food...especially this close to Argyle; however, this is a dang good $5 lunch option if you are in the hood. Mei Shung is BYOB and during a pleasant chat with the owner he expressed an interest in putting his chef to a test with some of the Taiwanese dishes..."he gets not enough practice." Last edited by pdaane on June 7th, 2005, 1:31 pm, edited 1 time in total. Add Evanston Chicken Shack to this list. Yesterday I had their 2-wing 2-thigh special (including fries and, of course, white bread) for $4.60. Excellent bird, posted on here frequently (e.g. here. Today I dug myself out of my lunch rut by going to Lake Forest. In the same building which houses South Gate restaurant and Bank Lane Bistro, there is Bank Lane Bakery. Bake Lane Bakery not only sells bread along with cheeses, saucisson and pates. They serve lunch, which you can take-out or eat-in. They offer salads, soups, sandwiches and quiche. The bargain there is the day-old quiche at $2.50 as opposed to the daily special at $3.75. If you are twice hungry, then order two quiches to reach this threads designated $5 limit. My quiche today was smoked turkey, dried cranberries, mushrooms and muenster cheese (pictured below). The other day old quiche was Applewood smoked bacon quiche with roasted red potatoes, chives and cheddar cheese. Today's special quiche was asparagus, onion and cheese. They had outdoor seating adjacent to those eating at South Gate for considerably more. Cathy2 wrote: The bargain there is the day-old quiche at $2.50 as opposed to the daily special at $3.75. 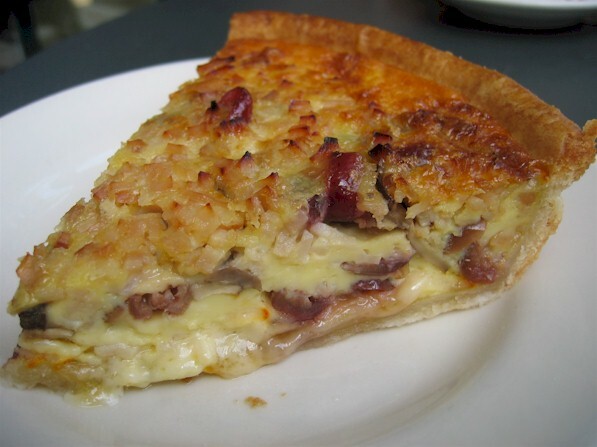 [...] My quiche today was smoked turkey, dried cranberries, mushrooms and muenster cheese (pictured below). Yeah, but besides being a bargain, I want to know if it was actually good? I omitted the most important part: it was very good! Chilaquiles, eggs scrambled with fried tortilla bits, chopped tomato, onion and jalapeno pepper. I always ask for the addition of Chorizo and extra fresh jalapeno. Chilaquiles come with wonderful rich lardy refried beans, ok rice and tortillas. Opt for the excellent house made flour, as opposed to commercially produced corn, tortillas. Chips, a bowl of spicy pickled jalapeno/carrot, two types of salsa and an ever changing free starter are included. Today the 'amuse' was a cup of incredibly rich chicken soup with carrots and a wing drumette. Other under $5 dishes I enjoy at Nuevo Leon include Menudo, the large is $5, small $3.50, Guisado de Res/beef stew and Machacado con Huevo/seasoned shredded steak scrambled with eggs served w/refried beans, lettuce and tomato. Polish Sausage, or hot dog, and unlimited fountain soda. G Wiv wrote: Lunch, under $5, not including tax and tip, no sandwiches, hot dogs, Polish, subs etc. It is sad, really, the way the consumption of salty Costco sausages has stymied Gary's once-great mental acuity, as it has so many others. I suspect the NaCL has pickled (or perhaps iodized) his frontal lobes; a sad case, really, and about which the CSPI should be alerted, post haste. JimInLoganSquare wrote: It is sad, really, the way the consumption of salty Costco sausages has stymied Gary's once-great mental acuity, as it has so many others. I took my "no sandwiches, hot dogs, Polish, subs etc" edict with a grain of salt. 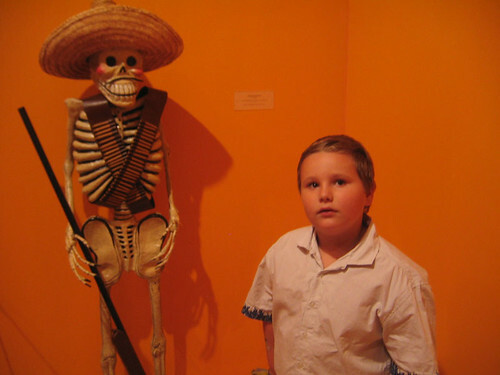 So a couple of Sundays ago we decided to go to Pilsen, take the kiddies to the Day of the Dead exhibit at the Mexican Fine Arts Center to help develop their Goth sensibilities, and then have lunch somewhere. Of course, deep down I had a plan all along-- chilaquiles at Nuevo Leon! The place was packed but the line moved quickly and we were soon seated. That was the good news. The bad news was that when I got my chilaquiles, I never got the tomato sauce or whatever it is, the non-salsa that all the other tables had. And no chance to ask the waitress moving at light speed for it. So I had rather dry, greasy, wan, underabundant chilaquiles, deeply underwhelming ones that looked like they'd been prepared in a garbage disposal. Partly NL's are a different style, GWiv said-- different not only from my Ameri-quiles at Kitsch'n but what I had in Playa del Carmen (currently being battered by Hurricane Wilma, sadly). But whatever the style, it can't have been helped by the lack of one of its essential lubricants. All in all, a disappointing, cranked-out-by-the-factory meal from a place I had good memories of; less Nuevo Leon than Nuevo Leona's. Better Mexican was to come shortly, however-- continued here.